This week, I look at a few questions about managing an iTunes music library, dealing with liner notes, album artwork in WAV files, and correcting capitalization in song titles. I also suggest a way to download music from the iTunes Store with an old Mac. Q: I’ve been ripping my CD collection and I’d like to add liner notes to my iTunes library. I’m happy to scan the CD inserts but what’s the best way to add these files so I can easily access them? 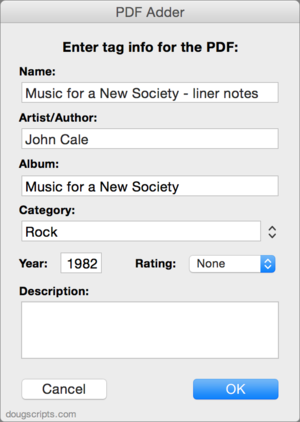 PDF Adder does the tagging you need so your liner notes stay grouped with your music files. There are two ways you can do this. One is to scan each page of the insert and add it as album art to the appropriate music files. 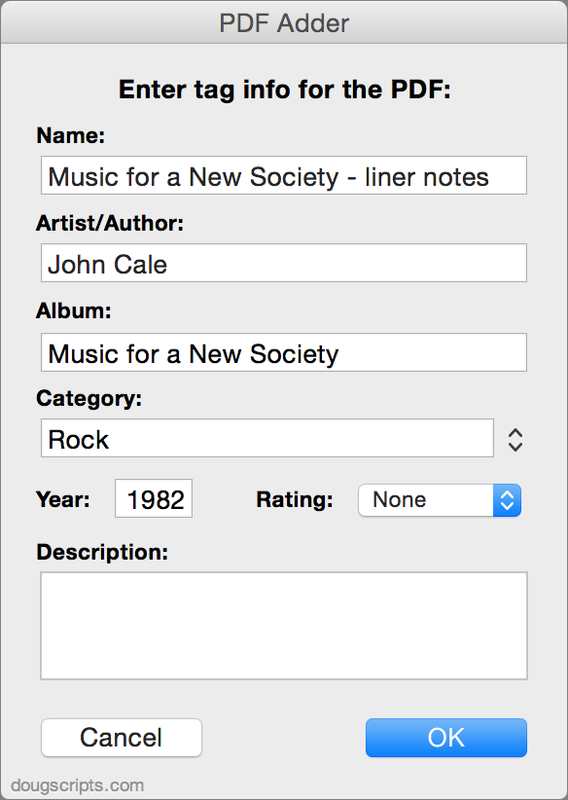 iTunes lets you add multiple graphics to files; you can do this by selecting all the tracks of an album, pressing Command-I, clicking the Artwork tab, and then dragging or pasting the graphics. But that’s not the easiest way to access the liner notes; you’ll need to select a track and press Command-I to read them. If you scan the inserts and save them as PDFs, you can put all the PDFs in a folder, and make sure you label them correctly. You can then search that folder for the liner notes for the album you want. But you can also add them to your iTunes library. Doug Adams has a free AppleScript called PDF Adder that makes this process easier. Using this script, you enter tag information for the PDF, so it gets stored together with your music files. Q: I rip music files from my CDs in WAV format. Most album artwork downloads from the iTunes Store, but some does not. For those, I want to manually add artwork but iTunes won’t allow me to do this. I’ve heard that one must convert WAV to an Apple format. I would prefer not to do that. How can I add artwork to these files without converting all WAV files to Apple format? WAV files don’t support album art—and even other tags—correctly. When iTunes downloads the artwork, it stores it in your iTunes folder, but not in the music files themselves. There’s no reason to rip the files to WAV. It’s better to use Apple Lossless, which offers the exact same quality and takes up less space. Apple Lossless files are about half the size of WAV files (on average) and support all the tags you can apply in iTunes. So if you want lossless quality, ripping to Apple Lossless makes more sense. If you ever want WAV files in the future you can always convert them with no loss of quality. 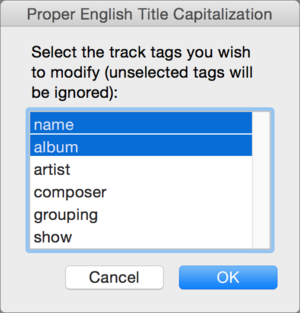 This AppleScript can fix the capitalization errors in your iTunes library in one pass. Q: I have a bunch of MP3s that are inconsistently labeled, mostly all lower-case. Do you know a way to batch-change them into proper title case? For instance, I’d like to change “ray charles - america the beautiful” to “Ray Charles - America the Beautiful.” I know how to do this by hand, but there are hundreds if not thousands just like it. Is there freeware or some inexpensive utility that can do this quickly and elegantly? As is often the case, Doug Adams has an AppleScript that will do exactly what you want. Proper English Title Capitalization looks at any tracks you have selected and changes their tags—name, album, artist, composer, grouping, or show—to the correctly capitalized version. You can also set up exclusions, if you wish to not capitalize certain words. Q: I have a number of playlists on my iMac that I sync to my iPhone. On the iMac, the playlists are in a folder, to keep them separate from other playlists that I do not want to sync. Whenever I sync the iPhone, the enclosing folder also gets synced to the phone, so to look at my playlists on the iPhone, I first have to open the enclosing folder. Is there away to just sync the playlists, and NOT the folder they are in? I do the same thing. I have lots of folders, actually, with a number of playlists that I sync, and others that I don’t sync. Many of these folders only have a single playlist that syncs to my devices, so I see those “top-level“ folders on the device. Alas, iTunes replicates its playlist layout structure when you sync your content to an iOS device. The only way to avoid this is to move the playlists out of folders. But if you depend on folders as I do, then it’s not a good solution. Q: I have an old iMac running OS X 10.6.8. The iTunes Store tells me I need 10.7.5 in order to download music. Is there a way to do this about which I am unaware, or am I just plain out of luck? Do you have an iOS device? You can download to the device, then sync to the Mac; assuming that your version of iTunes supports your device. Other than that, the only other way to do it would be to find someone else with a computer, log into your iTunes Store account, download the files, copy them to, say, a flash drive, and then copy them to your iMac.